Accretion lays out for investigation the evidence of a particular human behavior: the relentless accumulation of THINGS over time… things that matter to us as individuals, for whatever reasons. 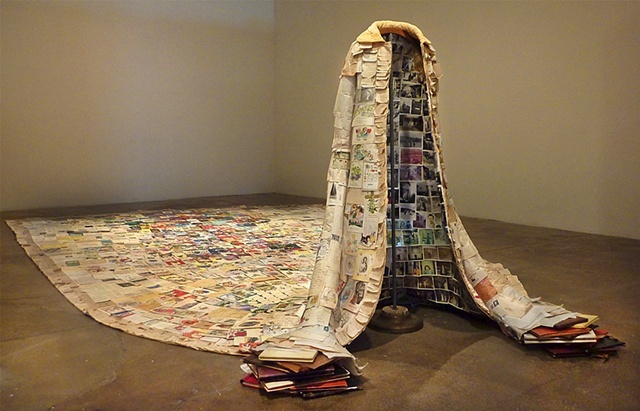 This artwork physically manifests itself in the exaggerated form of an ordinary object, a housecoat, covered with the residual ephemera carefully saved by one person. It sheaths the garment, chronologically layered like scales, expansively trailing out behind and amassing at the ends of sleeves in heaps. Massive numbers of greeting cards make up the bulk of the mementos covering this piece, accented with bills, receipts, notes, documents, etc. Inspirational quotes, prayers and poems are layered along the edges of the garment like a lyrical fringe. Hand written letters, albums and scrapbooks are heaped at the sleeve ends. The inside of the robe is entirely lined with personal photographs. These are the remains of day-to-day living, part of the material accretions of human activity.